Why is There a Turkmen Delegation in Washington? Ashgabat is nervous about the border with Afghanistan, but you wouldn’t know it inside the country. Turkmenistan’s 744-kilometer border with Afghanistan is as weak as it has ever been and it’s difficult to assess whether the country–even with help–can truly handle the trouble brewing across the border. The deterioration of security in northern Afghanistan–epitomized by the ongoing battle for Kunduz but illustrated also in attacks staged by militants in Badghis and Jowzjan provinces–has only solidified Ashgabat’s fear. Another contributing factor has been the rise of militants aligning themselves with ISIS and the return of the IMU to northern Afghanistan after years in Pakistan, which has made Turkmenistan’s previous policy of lightly managing across the border impossible to maintain. Speaking at George Washington University in Washington D.C. last week, the director of RFE/RL’s Turkmen Service, Muhammad Tahir, acceded that regional governments may exaggerate the threat of militants but in the case of Turkmenistan and Tajikistan, “things might be a little different.” Tajikistan, which shares a 1,300 kilometer border with Afghanistan, faces many of the same threats emanating from Afghanistan as Turkmenistan, but as Bruce Pannier noted recently, Turkmenistan (and Uzbekistan) don’t have treaty-bound allies that will come to their aid–and Tajikistan does. Turkmenistan has been beefing up its military capabilities and as Tahir pointed out, having done away with essentially all internal sources of opposition long ago, this can be interpreted as a response to the crisis in Afghanistan–rather than primarily a crackdown on internal competitors. Tahir said the country has been secretive about its preparations, official media have not covered cross-border attacks or the measures Ashgabat has taken to secure the border. 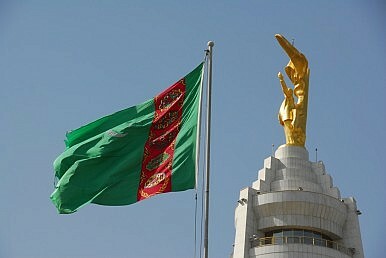 According to some reports, Turkmenistan has moved as much as 70 percent of its military forces to the Afghan border. This hasn’t always been Turkmenistan’s approach to the border. In the past, Tahir said, Ashgabat tried quietly building bridges to ethnic Turkmen communities in northern Afghanistan. For a time, this worked. But the influx of militants into the region has prompted those same ethnic Turkmen communities to take up arms against the newcomers. Turkmenistan, wanting the communities as a buffer but unwilling to pick sides among militants, ceased its engagement and set to erecting 3-meter high fences and digging ditches all along the border instead. Turkmenistan, an avowedly neutral country, has apparently gone as far as expressing a desire for U.S. military equipment and technology to combat the insecurity on its border, according to the head of U.S. Central Command, General Lloyd Austin, in congressional testimony in March. This week, a Turkmen delegation, led by Rashid Meredov, the foreign minister, is in Washington. In all likelihood, the conversations had between U.S. officials and the Turkmen delegation will revolve around the Afghan border. And because the U.S. is deeply concerned about the failure of security in northern Afghanistan, Washington may be willing to overlook Ashgabat’s human rights sins. While the story spun by Turkmenistan for external audiences may accept, if not embrace, the reality that the border is a source of weakness–the internal narrative is exactly the opposite. There is very little real news within Turkmenistan (let alone outside Turkmenistan about the country). What legitimate news sources exist are under extreme pressure. Tahir said that six of nine RFE/RL Turkmen correspondents have been pressured out of journalism altogether by the authorities, including one who was recently sentenced to three years in jail on spurious drug charges. “I strongly believe that silencing the messenger is not a solution,” Tahir said. Marking a Year After Protests in KazakhstanDiscussing Dictators and Nuclear Fallout in Central AsiaAll Quiet on the Turkmen Front?What Happens During Turkmen Military Drills?Can China Really Save Central Asian Economies?